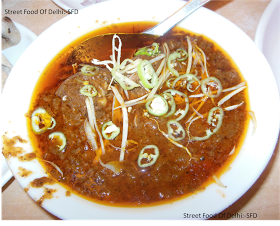 For a long time, I have been discussing with my friends about the mouth watering food at Zakhir Nagar. Today, I satisfied my hungry soul after visiting Zakhir Nagar. I visited “Purani Dilli restaurant” with one of my German friend who is a great foodie. He is studying medicine in Munich but loves oily and spicy food without caring about his arteries. The best way to be at Zakhir Nagar is by rickshaw from Jamia University or Maharani Bagh. The lanes of Zakhir Nagar are engulfed with famous Non- vegetarian eateries. Purani Dilli has entered into its sixth glorious year in serving mughlai food. The menu starts with “cooking is an art”……and we possess the instinctive art of cooking. Our delicious and mouth watering recipes will bring back the memories of “shahjahanabad”to you. Carefully prepared using original recipes and authentic spices, food at “Purani Dilli” Restaurant is an exquisite treat for a person of refined taste like you. It indeed was delightful to taste the food of “Purani Dilli”.It was also a pleasant surprise to see the son of the owner of this restaurant , who studies in a school,gracefully eating chicken fry with rumali roti. We asked for half plates of nahari,haleem and chicken achari. Haleem and Nahari were of Rs 135 each..Haleem was topped with green coriander leaves, crisp onion strips and ginger pieces. They served a plate full of crisp onion strips,gingerpieces,green chillies,lemon and masala, which you can add to Haleem according to your taste. The nahari and Haleem is truly delectable. The spices were up to the mark and one can digest it comfortably without causing harm to the stomach and intestines. Moreover, the meat served over there is soft and it melts inthe mouth like anything. We rounded up our meal with one of my favourite dessert (Kheer),which was again great in taste.